Samsung Flat-panel TVs with 30 channels of HD programming. Easy-access Plug-and-Play feature makes it simple to connect electronics. 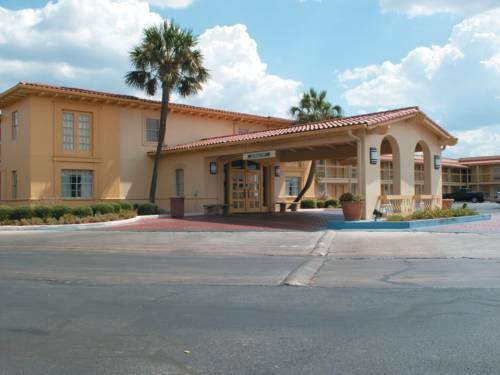 The La Quinta Inn San Antonio South Park features free high-speed Internet access and more! The La Quinta Inn San Antonio South Park hotel is located just south of downtown San Antonio, with convenient access to popular area attractions, including the Colonial Mission Trail, the Riverwalk, and the Alamodome. Within a half hour, reach San Antonio International Airport, SeaWorld or Fiesta Texas, and the neighboring cities of Von Ormy, Somerset, Poteet, and Pleasanton TX. We are within walking distance to South Park Mall and the Mayan Movie Theatre. Palo Alto College and Lackland Air Force Base are just a short drive. The La Quinta Inn San Antonio South Park is a pet friendly hotel. Rooms are spacious and clean and boast such amenities as free high-speed Internet access, a coffee maker, iron/board, and a Samsung Flat-panel TV with 30 channels of HD programming. Relax on the sundeck around our sparkling outdoor swimming pool. Our proficient staff provides a Free Bright Side BreakfastTM every morning and we have a restaurant next door. We are located on Interstate 35 at the Military Drive intersection. Access to major interstates is easy, and we have plenty of large vehicle parking. Near Toyota's San Antonio plant, Southwest General Hospital, and Kelly USA Business Park. Reservations must be cancelled by 6pm local inn time or guest will be charged 1 night's room and tax.